Like many people who have taken a high school science class, I have seen the old, familiar periodic table of the elements hanging on a classroom wall on in the back of the chemistry textbook. I sometimes looked at that table, wondering about the strange letters and numbers on it. Obviously, H stood for hydrogen and O for oxygen, and C for carbon, but why Fe for iron, or Sn for tin and Au for gold? What was an atomic number and what was its relation to atomic weight? Little did I know that behind the periodic table were stories of mystery, adventure, and romance? 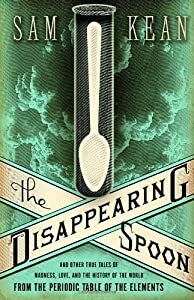 Sam Kean tells these stories in his wonderful book, The Disappearing Spoon. He takes the reader up and down the table with stories of elemental discoveries, their differing properties and their impact on the course of history. We learn of the invention of the table, usually attributed to Dmitri Mendeleev, though the story is a little more complicated. We learn of the hunt for elements to fill in the empty spaces and some of the deadly consequences of the discovery of the radioactive elements. How the elements changed the course of history and the results of wars. In the final chapter Kean goes above and beyond the familiar table to introduce the reader to newly discovered exotic forms of matter that might require a periodic table all their own. Overall, Sam Kean does a marvelous job taking what might be considered a dry and dull table of symbols and numbers and bringing it to life. The Disappearing Spoon was a joy to read.